.W. 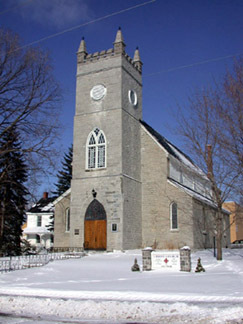 Edwin Sowter was an active and respected member of his local anglican church parish, Christ Church in Aylmer, Québec. The quarried limestone building, originally built in 1843 and expanded in 1882, is located on Charles Street, just a few blocks away from Sowter's home on Broad Street, known as Cherry Cottage. It was in Christ Church that Sowter married Theresa Larue on September 4, 1882, a mere three months before he penned a heartfelt poem to mark the tragic passing of the congregation's pastor, the Rev. G.C. Robinson. The modest stone construction is lovingly cared for by parishioners who maintain much pride for the integrity of their building and its interior. Among those elements which constitute a rich heritage for the parish and the town of Aylmer, is the painted scripture which runs around the top of the two long side walls of the main part of the church (example 1, example 2). This beautiful text was executed by T.W.E. Sowter at some unknown date, but likely sometime in the early 20th century. Additionally, a banner, executed in the same golden lettering adorns the rear wall, above the door of the main entrance, while golden fleurs-de-lys line the tops of the walls within the chancel. "Before leaving the chancel look upward to the ceiling where you will note the fleur-de-lys motif at the centre of the roof panels. This is repeated in the painted decoration at the top of the wall. It is significant that this symbol is both the representation of the Holy Trinity, an emblem of the Virgin Mary and the emblem of the province of Quebec. The painted wall decoration is of gold leaf and was executed by a member of the congregation, Mr. T.W.E. Sowter. It remains today as a memorial to this man's artistry and devotion to his church."